One year ago, I was witness to a number of incredible sporting achievements in the Chinese capital. The opening week of the 2008 Olympic Summer Games in Beijing, belonged to Michael Phelps. The United States swimmer capturing our imaginations with his incredible, gold medal-winning performances in the pool. Usain Bolt looks unstoppable ahead of this upcoming world athletics championships in Berlin. If Phelps whet our collective appetites, then Usain Bolt delivered the dessert! The Jamaican sprinter closed out the Beijing Games with a bang…three races, three world records, three Olympic gold medals. A year later, at the World Athletics Championships in Berlin, Bolt is ready to defend his title as “World’s Fastest Man”. It is not likely that he will leave Germany disappointed. Proclaiming that he is in the best shape of his life, defending world champion Tyson Gay is prepared to give Bolt the challenge that he never had in Beijing. The anticipated Bolt-Gay Olympic showdown did not materialized after the American pulled a hamstring muscle in the U.S. Olympic trails. Berlin provides Gay a platform to show that he can give Bolt a “run for his money”. The last time these two men met was in May 2008. It proved to be Bolt’s coming out party. While previously running in relative anonymity, Bolt burst onto the scene that night in New York with the first of his two world records in the 100-meters. Gay has been playing second fiddle ever since. It would probably be for the good of athletics if Bolt had some real competition. Then again, don’t we wish that for other sports? Who has stepped up to tame Tiger Woods in golf? Why hasn’t anyone halted, or even slowed, the Roger Federer Express in men’s tennis? Tyson Gay doesn’t sound intimated by Usain Bolt and he’s quick to give the Jamaican his “props”. But, until he proves otherwise, Gay will always have to hear that that he is a good but not a great sprinter. Last month, before a meet in London, Bolt told a reporter that on his best day he doesn’t think that Gay can beat him. The Jamaican has had a number of “great” days over the past year. There’s no reason to believe that he won’t enjoy a satisfying stay in the German capital. An excellent athlete, Usain Bolt has demonstrated competence and confidence that makes him unbeatable at this time. Quoting Assafa, "anybody can be beaten" and should that happen this weekend, Usain is man enough to come out a winner any way!! He did it in Beijing, we are looking for him to repeat it in Berlin. I am a Jamaican writing from Canada. Anyone knows the results of Bolt Vs Gay in Berlin or am I ahead of myself. If so, what time is the race? BEAUTIFUL ARTICLE ! I REALLY ENJOYED IT. THAT IS UNTILL THE PART ABOUT GREATNESS. ONE DOES NOT HAVE TO BE NUMBER ONE TO BE CONSIDERED GREAT. TIGER WOODS DOES NOT ALWAYS WIN, SO DOES THAT MAKE HIM LESS THAN GREAT ? MAY THE BEST MAN WIN ! NOT THE GREATEST. There is absolutely no doubt that Bolt will get the gold medal. Concerning your comment about competition for Roger Federer, hasn’t Nadal taken on that role? Until his injuries earlier this year, he not only slowed the Federer Express, he actually halted it. He was ranked number one in the world and was the favorite at every tournament he entered. Bolt just sped off in berlin with 9.58 sec !! lightening mix with thunder !! Bolt is the greatest "2 di wurld"
Yes but in the other article on Bolt's WR of 9.58 it states "Bolt was clearly up out of the blocks before the starting gun - which under next year's new rules would have disqualified him automatically" Under the current rules the race would still have to be restarted anyway. You simply cant get away with it. No he wasn't out of the blocks early. Look up the reaction times on the IAAF results list. Bolt's was the second slowest at .146. The only person slower out of the blocks came last. Bolt's reaction was reasonable but for a WR rather sluggish. Ok. Just letting you know. If the article was referring to the Semi Final then Bolt's reaction time of .135 is very good but if you check the IAAF results there are many other faster reaction times. Powell was faster in the Quarter Final. Still it shows Bolt can take another tenth of his 9.58 just from the start alone. Sure he will end up around 9.45 or something. Usain Bolt is just stupendous and unbelievable that is all l have to say , he is just out of this world. 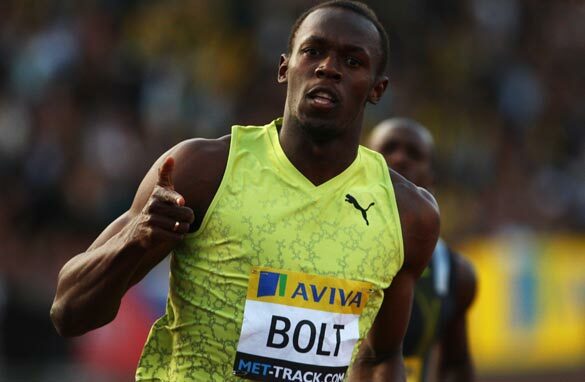 Bolt is excellent in most aspects of a supersprinter. His physique, height gives him a bit of an advantage over the rest of the other sprinters. Moreover, his presence and winning has broken the monopoly of the US (American) athletes on the sport. My bet will be US has an already made challenger(s) for Bolt in the wings. That can only mean close competition between Bolt and the challengers. Super human stunts?? I want to see the reaction of the scientists....could he have stretched his own human limits? Could he stretch them further? I watched the race live on cable....wow...this guy is unreal. He's on a different plateau. Are you joking? Tyson Gay ran the 3rd fastest 100m dash (non-wind aided) of all time. He also ran sub 9.7 with a non-legal wind last year. There is only one person in the world who can beat him. He probably can't beat Usain Bolt, but second fastest man on the planet is a pretty nice quality to have. If you think Usain Bolt is great (which he definitely is), and Tyson Gay is only good, then you probably think Asafa Powell is OK.
And you also mentioned Roger Federer being unstoppable. Who is Rafael Nadal? Until he hurt his knees and sat out a major tournament he was ranked #1 in the world ahead of Federer. usain just bolt the world and i dont think any body in this plannet even the U.S.A can ever unlock it again from now till the next millenium. why did gay think he could have won ? Usain Bolt is here for a long time. Wen i 1st saw Bolt in d heats at Beijin, i thought he was jogging yet d qualifying time suggest he wasnt. He seem to stroll effortlessly. Dat to me was d sign of greater things to come. He is still young & can set even greater records un imaginable. I b'liv 4 now he alone will d competing against himself. B'cos all others are just spectarors & may remain so 4 very long time to come. Bolt is simply Excellence Personified !!! Congrats also to Ryan M. Brathwaite of Barbados for his great victory in the 110m hurdles. It was truly the most exciting finish of the World Championships. Barbados finally gets to hear it's National Anthem played on the World stage. Like Usain you have done your Caribbean country proud. History maker Usain Bolt continues to challenge fellow sprinters and sprint historians with his marvellous running. What a fine advertisement for sports ! Usain has been creating & breaking records since he was 15-y-o. he was 15-y-o when he became the world's youngest Junior Champion, and he ran a sub 20 second race when he was 17-y-o at 200m. So if all you folks were true Track & Field enthusiats, you wouldn't be too surprise at his exploits on the the tracks. To see his 15-y-o race, type Junior World Championship Games 2001 or 2002 and you will have the opportunity of seeing the YOUNG LEGEND in the making. Unbelievable can only begin to describe the combination of stride length and stride rate. Much more to come with the 400 meter going down soon!